QuantumCubeTM systems start at under $11k (under $10k with an academic discount). StereoStation TM system prices start at under $4k. Academic institutions qualify for a 10% discount on QuantumCubeTM systems and 5% discount on StereoStationTM systems. Please email us at sales@pqs-chem.com or call us at 1-877-759-2777 or 1-479-521-5118 to request a specific quote. We accept purchase orders (POs) by FAX at 1-877-863-5705, regular mail and email (sales@pqs-chem.com). Please include an email address in the PO. Visit the contact page for full contact information. We will promptly confirm the receipt of an order usually via email. Please allow 30 days for assembly, testing and delivery of the system. Please use the form below to send a request for a quote. Please include your full name, title, address, email and phone number. Click on the button next to the desired product to put it in your PayPal shopping cart. The PayPal shopping cart will open in a separate window. Complete the PayPal checkout procedure by clicking on "Proceed to Checkout". After receiving notice of payment, we will send download instructions with a username and password to access our download area, to the email address given during the PayPal checkout. Download and install the product. NOTE: To pay using VISA, MASTERCARD, Discover or American Express credit card please click on the "Check Out" button in the PayPal shopping cart. To use your PayPal account please click on the "Check out with PayPal" button. We also accept purchase orders (PO's) by FAX 1-877-863-5705, mail (contact) and email (sales@pqs-chem.com). Please include an email address in the PO. Visit the contact page for full contact information. For an introductory period we offer our PQS 3.3 users a free upgrade for 1 year to PQS version 4.0. Please use the form below to send a request for an upgrade. Please include your full name, title, address, email and phone number. Upon receipt we will send you download and installation instructions for the software. On the initial run of the PQS Software a lockcode will be generated. Send this lockode to licenses@pqs-chem.com. We will then generate and within 1 buisness day send you a license matching that lockcode, along with instructions on how to unlock PQS Software - essentially the path where to copy the license file. Prices are for an annual license. * maximum allowed number of computing processes per job. 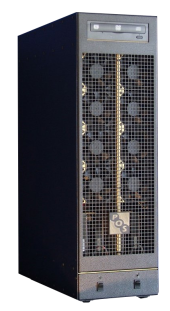 PVM or MPI is required for jobs spawning 2 or more computing processes. ** parallel version is NOT available for Windows - serial version (one computing process per job) only. Copyright © 2011 Parallel Quantum Solutions; All right reserved.